Apoptosis, or programmed cell death, is a physiological form of cell death that is important for normal embryologic development and cell turnover in adult organisms. Cumulative evidence suggests that apoptosis can also be triggered in tissues without a high rate of cell turnover, including those within the central nervous system (CNS). In fact, a crucial role for apoptosis in delayed neuronal loss after both acute and chronic CNS injury is emerging. In the current review we summarize the growing evidence that apoptosis occurs after traumatic brain injury (TBI), from experimental models to humans. This includes the identification of apoptosis after TBI, initiators of apoptosis, key modulators of apoptosis such as the Bcl-2 family, key executioners of apoptosis such as the caspase family, final pathways of apoptosis, and potential therapeutic interventions for blocking neuronal apoptosis after TBI. Each year in the USA, more than 1 million patients undergo medical evaluation and treatment for acute head injury . In the USA there were an average of 53,288 annual traumatic brain injury (TBI)-related deaths from 1989 to 1998, or 19.3 per 10,000 . In Germany, the TBI death rate in 1996 was 11.5 per 10,000, with a total of 9415 deaths . A 15-year study in Denmark showed that the mortality of children after TBI was 22%, and among those survivors of severe head injury, significant numbers were found to have serious neurological disabilities . A regional population-based study in France showed that the mortality of hospitalized TBI patients was as high as 30.0% . Similar data can be found in studies from a variety of demographic and cultural settings [6, 7]. Acute and long-term care of TBI patients has become a significant social and economic burden around the world [8–10]. The neurological outcome of TBI victims depends on the extent of the primary brain insult caused by trauma itself, and on the secondary neurochemical and pathophysiological changes occurring as a consequence of the mechanical injury, which leads to additional neuronal cell loss. Although a long list of experimental studies suggest that reduction or prevention of secondary brain injury after TBI is possible, clinical trials have failed to show benefit from therapeutic strategies proven to be effective in the laboratory [11–13]. This might reflect the diverse nature of clinical TBI and/or perhaps an incomplete understanding of the mechanisms of secondary neuronal loss. Two waves of neuronal cell death occur after TBI. Immediately after mechanical trauma due to impact or penetration, neurons can die by necrosis caused by membrane disruption, irreversible metabolic disturbances and/or excitotoxicity . Early application of neuroprotective protocols seems critical for any possibility of reducing neuronal necrosis; however, this is beyond the scope of the current review. The second wave of neuronal death occurs in a more delayed fashion, with morphological features of apoptosis (or programmed cell death). This second wave of neuronal cell death presents within a time window that may be responsive to targeted therapies . 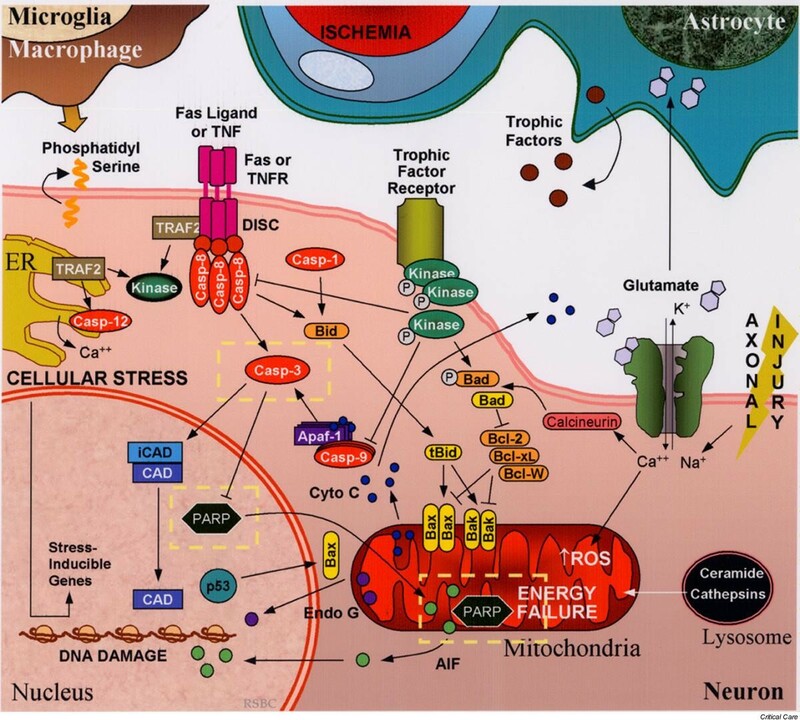 The current review summarizes clinically related investigation of apoptosis after TBI, as well as potential therapeutic interventions for altering apoptosis to improve neurological outcome. Apoptosis has long been identified as an evolutionarily conserved process of active cell elimination during development. Its phenotypic features include DNA fragmentation and chromatin condensation, cell shrinkage, and formation of apoptotic bodies, which are cleared by phagocytosis without initiating a systemic inflammatory response. The execution of apoptosis requires novel gene expression and protein synthesis [16–18]. Apoptosis has evolved as an intricate and critical mechanism for balancing cell proliferation and for the active remodeling of tissues during development. The identification of apoptosis under pathological settings dates back to the 1960s, when John FR Kerr was studying ischemic liver damage . He observed a novel cell death phenotype that was morphologically distinct from classical necrosis. Dying hepatocytes in the ischemic penumbra were found to have shrunk to form small round masses of cytoplasm containing condensed nuclear chromatin. These dying cells were taken up by neighboring hepatocytes and phagocytes without initiating a broader inflammatory response. This phenomenon was also recognized in normal rat livers. This distinct type of cell death, temporarily named 'shrinkage necrosis' , was also found to occur in cancer  and during normal development . The term 'apoptosis' was subsequently coined to replace shrinkage necrosis , and has later been used interchangeably with programmed cell death, albeit loosely, because of similar requirements for genetic programming and new protein synthesis, as well as morphological similarities . The identification of post-developmental apoptosis in Huntington's disease opened a new avenue of research in acute and chronic neurological diseases . Although histological descriptions of apoptosis after experimental TBI  were reported in the same era as the seminal reports by Kerr and colleagues noted above, the characterization of neuronal apoptosis after experimental TBI occurred less than a decade ago [27–29]. Histological descriptions of apoptosis after human head injury [30, 31] actually predate those by Kerr and colleagues, but similarly to experimental studies, characterization of apoptosis after TBI in humans has occurred only recently . The endpoint of neuronal apoptosis after brain injury is the systematic fragmentation of cellular DNA and the collapse of nuclear structure, followed by the formation of membrane-wrapped apoptotic bodies [29, 33] that are subsequently cleared by macrophages/microglia signaled by phosphatidylserine exposure on the cell membrane surface . The process of apoptosis can occur by multiple pathways that may be independent; however, crosstalk between these pathways can also occur  (Fig. 1). In broad terms, neuronal apoptosis can at present be segregated into two pathways, one involving the activation of a family of cysteine proteases termed 'caspases', and one involving the caspase-independent release of apoptotic factors from mitochondria . Simplified schematic representation of the initiation and regulation of neuronal apoptosis after traumatic brain injury (TBI). Pathologic mechanisms triggering apoptosis after TBI include ischemia, oxidative stress, energy failure, excitotoxicity (primarily excess glutamate), axonal injury, trophic factor withdrawal, ER stress, and/or death receptor-ligand binding (for example TNF, Fas). Regulation of apoptosis occurs through multiple pathways including kinase-dependent intracellular signaling pathways and Bcl-2 family proteins. Execution of apoptosis involves the caspase cascade and/or release of apoptogenic factors from organelles such as mitochondria and lysosomes. Ultimately DNA fragmentation, cytoskeletal disintegration, and externalization of membrane phosphatidylserine occurs, signaling macrophages and microglia to engulf cellular debris. Potential therapeutic targets discussed in this review are highlighted within the dashed yellow lines. AIF, apoptosis-inducing factor; Apaf-1, apoptotic protease activating factor-1; Bcl, B-cell lymphoma; CAD, caspase-activated deoxyribonuclease; casp, caspase; cyto c, cytochrome c; DISC, death-inducing signaling complex; Endo G, endonuclease G; ER, endoplasmic reticulum; iCAD, inhibitor of CAD; ROS, reactive oxygen species; tBid, truncated Bid; TNF, tumor necrosis factor; TNFR, TNF receptor; TRAF2, TNF receptor associated factor. Caspase family proteases include 14 currently identified members that are synthesized as pro-enzymes . After proteolytic cleavage into large and small subunits, they are capable of forming active tetrameric proteases . Initiator caspases, including caspase-8, -9, and -10, are activated by auto-cleavage and aggregation. Caspase-3, -6, and -7, referred to as 'executioner' caspases, are cleaved and activated by initiator caspases. The proteolytic cleavage of caspase substrates produces the phenotypic changes characteristic of apoptosis, including cytoskeletal disintegration, DNA fragmentation, and disruption of cellular and DNA repair processes, all of which have been reported after experimental TBI [38–40]. Caspase-dependent apoptosis can occur via extrinsic or intrinsic pathways. Extrinsic pathways involve cell surface receptors present on multiple cell types including neurons . The coupling of cell surface tumor necrosis factor (TNF) with extracelluar TNF or Fas receptors with extracellular Fas ligand induces trimerization of the receptors that form complexes with intracellular signaling molecules: TNF receptor associated death domain protein and Fas-associated protein with death domain. This death-inducing signaling complex then binds and induces the auto-cleavage and activation of caspase-8  or caspase-10 . Caspase-3 is subsequently cleaved and activated by these initiator caspases, whereupon the process of apoptosis is irreversible. The intrinsic pathway is initiated by stress on cellular organelles, including mitochondria and endoplasmic reticulum (ER). Caspase-dependent apoptosis can be triggered by the mitochondrial release of cytochrome c induced after mitochondrial membrane depolarization and formation of mitochondrial permeability transition pores. Cytosolic cytochrome c interacts with apoptotic protease activating factor-1 (Apaf-1), ATP, and pro-caspase-9 to form a complex termed an 'apoptosome'. Apaf-1, a mammalian homologue of the Caenorhabditis elegans gene product CED-4, contains a caspase recruitment domain that binds pro-caspase-9. The multiple WD-40 repeats in Apaf-1 permit self-oligomerization and auto-activation of caspase-9, which in turn cleaves and activates caspase-3 . Recent data indicate that after being released from mitochondria, cytochrome c can translocate to the ER to block the inositol-(1,4,5)-trisphosphate receptor, amplifying calcium signaling and the release of cytochrome c from mitochondria . ER stress, including the disruption of ER calcium homeostasis and accumulation of excess proteins, induce apoptosis by the activation of ER-localized caspase-12. The ER-stress-related activation of caspase-12 has been detected in experimental models of neurodegenerative disease  and TBI , although in humans caspase-12 seems to have a role in inflammation but not in apoptosis [48, 49]. Other important enzyme families also contribute to apoptotic cell death after brain injury. Calpains are calcium-dependent proteases with many cellular targets including cytoskeletal elements. Calpain activation occurs after TBI and colocalizes with caspase-3 cleavage [39, 50]. Calpain inhibitors have been shown to reduce neuropathological damage after TBI in rats [51, 52]. The lysosomal enzymes, cathepsins, might also contribute to apoptotic cell death after brain injury , although studies showing a prominent role for cathepsins after TBI are lacking. Several mitochondrial proteins are capable of inducing apoptosis without activation of caspases, or without being affected by caspase inhibition. Apoptosis-inducing factor (AIF) is an evolutionarily conserved mitochondrial flavoprotein that can be released from mitochondria after mitochondrial membrane depolarization . The subsequent translocation of AIF into the nuclei induces the formation of large-scale DNA fragmentation (more than 50 kilobase pairs), a signature event of AIF-mediated cell death. AIF-mediated apoptosis occurs in neurons under conditions of oxidative stress , as well as in experimental TBI  and brain ischemia in vivo. Other apoptosis-related mitochondrial proteins include endonuclease G , Htr2A/Omi , and Smac/Diablo ; however, their roles in neuronal apoptosis after brain injury remain undefined. Studies [59, 61, 62] showing powerful detrimental effects of mitochondrially released proteins with important intramitochondrial functions illustrate the importance of cellular compartmentalization. It was recently discovered that poly(ADP-ribose) polymerase (PARP) activation, previously felt to contribute solely to necrotic cell death, could also contribute to caspase-independent apoptosis [55, 63]. Under conditions of severe injury, depletion of cellular NAD+ via PARP activation exacerbates energy failure, resulting in membrane leakage and necrosis . However, under conditions of incomplete energy failure, as can be seen in pericontusional regions in models of TBI, PARP activation can contribute to mitochondrial depolarization, AIF release, and apoptosis [55, 56]. Thus, PARP inhibitors represent a therapeutic strategy targeting both necrosis, if administered early enough, and apoptosis after TBI . Both caspase-dependent and caspase-independent apoptosis are regulated by the B-cell lymphoma-2 (Bcl-2) family of proteins, which include both pro-death and pro-survival members . Bcl-2 family proteins regulate the permeability of the mitochondrial outer membrane and permeability transition pore formation . They contain highly conserved Bcl-2 homology domains (BH 1–4) essential for homo-complex and heterocomplex formation . Complexes formed between proteins containing BH-3 domains such as Bax, truncated Bid, and Bad, can facilitate the release of cytochrome c from mitochondria . Upregulation of Bax with subsequent mitochondrial translocation can be induced by the tumor suppressor p53, which is increased in injured regions after TBI in rats [68, 69]. The anti-apoptotic members Bcl-2, Bcl-xL, and Mcl-1L prevent the release of mitochondrial proteins, including cytochrome c, endonuclease G , and AIF , by inhibiting the pore-forming function of BH-3 domain-containing Bcl-2 proteins . Recent studies have identified the existence of crosstalk between the extrinsic and intrinsic cell death pathways by means of the BH3 domain-only protein Bid . The anti-apoptotic gene bcl-2 and its protein product are upregulated in injured cortex and hippocampus after TBI in rats, and cells expressing Bcl-2 protein seem morphologically normal . Data from human studies suggest that Bcl-2 family proteins might also participate in the regulation of the stress response by interacting with heat shock proteins . Apoptosis can also be regulated by intracellular signal transduction pathways. Perturbations in mitogen-activated protein kinase (MAPK) signal-transduction pathways occur after TBI . Several components of the MAPK pathway–extracellular regulated kinase-1/2, c-Jun N-terminal kinase, and p38 pathways – are differentially activated depending on the region of brain and timing after injury [75, 76]. Activation of the protein kinase C signaling pathway has also been reported after experimental TBI . Pro-survival intracellular signal transduction pathways are also activated after brain injury. These include activation of the growth factor-induced protein kinase B (PKB) signaling pathway, which can directly inhibit apoptosis through the phosphorylation and inactivation of apoptosis-related proteins Bad and caspases-8 and -9 . Phosphorylation of PKB is not seen in cells that are positive for terminal deoxynucleotidyl transferase-mediated nick-end labeling (TUNEL) after TBI, providing indirect evidence that PKB inhibits cell death in vivo. PKB might also promote cell survival through the regulation of nuclear factor-κB and gene expression related to cyclic-AMP response element binding . Although phenotypic descriptions of apoptosis after TBI in humans date back to the 1940s [30, 31], biochemical evidence of the reactivation of the apoptotic cascade after TBI in humans has been reported only within the past decade. Injured brain tissue samples obtained from TBI patients requiring decompressive craniectomy for the treatment of life-threatening intracranial hypertension were found to have evidence of DNA fragmentation by TUNEL and cleavage of caspase-1 and -3, suggesting activation of caspase-dependent apoptosis . Activation of caspase-3 is also supported by studies demonstrating cellular alterations of one of its substrates, PARP, within brain tissue from TBI patients . Recently, the upregulation of caspase-8 in human brain after TBI at both the transcriptional and translational levels has been reported . In this study, caspase-8 was found predominantly in neurons. In addition, relative protein levels of both caspase-8 and cleaved caspase-8 correlated with relative protein levels of Fas death receptor, providing evidence of the formation of a death-inducing signaling complex and activation of the extrinsic pathway of apoptosis within neurons. Increases in Fas and Fas ligand have also been reported in cerebrospinal fluid (CSF) from TBI patients, with Fas levels correlating with intracranial pressure [82, 83]. Evidence for participation of the intrinsic pathway after TBI in humans also exists. Consistent with experimental TBI models is the observation that upregulation of Bcl-2 occurs in human brain from adults and in CSF from infants and children after TBI [32, 84]. In pediatric patients, lower concentrations of Bcl-2 were detected in patients that died than in those that survived, supporting a pro-survival role for Bcl-2 . The pro-death Bcl-2 family protein Bax is also detectable in contused brain tissue in TBI patients. Patients with detectable Bax but not Bcl-2 had a less favorable outcome than patients in whom both Bax and Bcl-2 were detectable . Although these studies demonstrate the acute initiation of apoptosis in human brain after injury, protracted apoptosis also occurs. TUNEL-positive cells have been detected in autopsy specimens from patients dying up to 12 months after their injury , perhaps suggesting that a relatively wide therapeutic window exists for the administration of treatments aimed at reducing apoptosis after TBI. In human head injury, apoptotic neuronal cell death has been identified in the pericontusional gray matter [32, 81] and in oligodendrocytes within white matter . In terms of defining brain regions where apoptosis occurs after TBI, these studies using biopsy tissue were limited by the focused location (lesion and perilesion area or non-dominant temporal lobe). However, autopsy studies also localize apoptotic, and TUNEL-positive, non-apopoptic cellular phenotypes, to the contusion or within close proximity to the contusion . Given the highly conserved nature of the apoptotic cascade, it is not surprising that there are several similarities in terms of initiation and reactivation of the apoptosis between acute brain injuries such as trauma and ischemia. In fact, all of the processes discussed above have been shown to occur in experimental models of both cerebral trauma and ischemia (reviewed by Liou et al. ). Similarities might also be related in part to the fact that the pathophysiology of trauma includes an ischemic component , although after trauma this usually involves hypoperfusion or 'trickle flow' rather than complete ischemia with reperfusion. One important difference seems to be related to the heterogeneity of the disease process in TBI compared with ischemia, in which in addition to hypoperfusion, conditions of contusion necrosis, excitotoxicity, axonal injury, and inflammation coexist (see Fig. 1). An important biochemical distinction might be an increased contribution of caspase-independent apoptosis after TBI in comparison with ischemia. A spectrum of cell death phenotypes, ranging from classic apoptosis to necrosis, has been described after TBI [27, 29]. However, retrospectively it seems that some cell death phenotypes previously described as necrotic might represent AIF-mediated apoptotic phenotypes, with peripheral chromatin condensation, less cellular and nuclear shrinkage (in comparison with caspase-dependent apoptosis), and large-scale DNA fragments. Indeed, large-scale DNA fragments identified with pulsed-field DNA gel electrophoresis are much more readily detectable than classic DNA laddering after experimental TBI [56, 89]. At present several unanswered questions remain. What is the relative proportion of neurons dying via apoptosis (as opposed to necrosis) after TBI, and is this proportion clinically meaningful? No study has directly measured the proportion of necrotic to apoptotic cell death in experimental TBI; however, information can be extrapolated from previous studies. For example, a 30% reduction in lesion volume is seen in rats treated with the caspase-3 inhibitor N-benzyloxycarbonyl-Asp-Glu-Val-Asp-fluoromethylketone (DEVD) measured 3 weeks after TBI compared with vehicle-treated controls . In transgenic mice overexpressing Bcl-2, in which both caspase-dependent and caspase-independent pathways, but less probably necrosis, would be inhibited, a 60% reduction in lesion volume is seen in comparison with wild-type mice . Thus, although speculative, in experimental models of TBI roughly one-third of cell death might be attributable to caspase-dependent apoptosis, one-third to caspase-independent apoptosis, and one-third to necrosis. This degree of programmed cell death would seem to represent a sizeable therapeutic target, and might be underestimating the total amount of apoptosis occurring after TBI, given the clinical studies showing protracted cell death extending months after injury ; whether or not this represents apoptotic cell death remains to be strictly defined. What cells undergo apoptosis after TBI? Although most research, including our own, has focused on neuronal apoptosis after TBI, other resident brain cells also undergo apoptosis. Astrocytes, important in glutamate uptake and in the production of lactate and antioxidants after injury [91, 92], demonstrate DNA fragmentation without classic apoptotic phenotypes after TBI, although to a much smaller degree than neurons [93, 94]. Oligodendrocytes also undergo apoptosis after TBI in rats and humans [84, 94]. Current opinion is that the order of vulnerability to apoptosis after TBI is neurons ≥ oligodendrocytes > astrocytes > microglia . The reasons behind this differential vulnerability remain speculative, but might involve higher metabolic rates and therefore higher potential for relative ischemia in neurons. It would also be interesting to determine whether there is a relationship between apoptosis and other prevalent clinical conditions seen after TBI. Temporal patterns of apoptosis  are similar to those seen for edema  and inflammation , with 'peak levels' seen between 24 and 72 hours after injury. Whereas in developmental apoptosis these conditions are felt to be mutually exclusive, ischemia resulting from edema-related increases in intracranial pressure could trigger apoptosis, as could inflammation. Hemorrhage generally precedes the occurrence of apoptosis after TBI, blood components are potent stimulators of apoptosis experimentally, and apoptosis is seen in humans with subarachnoid hemorrhage . In addition, caspase inhibitors reduce endothelial apoptosis and prevent vasospasm after subarachnoid hemorrhage in dogs . Does classic developmental apoptosis occur after TBI in the mature mammalian brain? This topic is quite controversial, and partly depends on semantics . Certainly there are caveats related to evaluating mechanisms of programmed cell death after brain injury. This is in part related to imprecise tools for identification. The most publicized example is that of TUNEL to identify DNA fragmentation, given that TUNEL will label both apoptotic and necrotic cells . In models of cerebral ischemia, electron microscopic examination of injured brain has led some investigators to conclude that apoptosis does not contribute to cell death . What is clear is the heterogeneous CNS diseases such as TBI and ischemia often result in a continuum of cell death phenotypes  that span from classic apoptosis to necrosis, and that many components of the programmed cell death cascade can be identified in multiple contemporary CNS injury models and in humans after TBI. Should apoptosis be targeted after TBI? Inhibiting apoptosis after pathological insults remains controversial because apoptosis is an evolutionarily conserved and vital mechanism for biological systems to eliminate abnormal or aging cells. This is essentially the opposite biological predicament to that seen with the use of chemotherapeutic agents designed to kill cells. However, experimental studies still support a beneficial effect of treatment with strategies that inhibit apoptosis after acute brain insults such as TBI. Molecular approaches that interrupt the apoptosis cascade have been enlightening and have provided proof of principle ; however, at present these seem to be far from clinical application. Preclinical studies interrupting apoptosis using contemporary models of TBI have shown promise [38, 40, 104]. Although pharmacologic therapies targeting apoptosis after TBI might not quite be ready for the clinic, they are in rapid development and could be in clinical trials soon. The complexity of the apoptotic cascade provides many opportunities, or perhaps more so challenges, for the design of interventions that might attenuate cell death (Fig. 1). Several hypothetical therapeutic approaches for reducing apoptosis after brain injury exist: first, inhibiting key initiators (for example with soluble inactive TNF-family receptors, anti-excitotoxic agents, or anti-oxidants); second, blocking key components of the apoptotic cascade (for example with anti-apoptotic Bcl-2 mimetic proteins, caspase inhibitors, PARP inhibitors, other protease and/or endonuclease inhibitors); third, inhibiting multiple components of the apoptotic cascade (for example with hypothermia [105, 106]); and fourth, enhancing pro-survival factors (for example upregulating stress proteins or facilitating PKB signal transduction pathways). In our opinion, the two most promising strategies in terms of biological potential based on key positioning within the apoptotic cascade and on the availability of pharmacological agents are caspase inhibitors to target caspase-dependent apoptosis and PARP inhibitors to target caspase-independent cell death. Caspase inhibitors include a group of small (typically one to four amino acids) peptide derivatives as well as novel non-peptide pharmacologic agents . The peptide derivatives have been tested in models of brain injury and are competitive inhibitors designed according to specific amino acid target sequences at the cleavage site of the respective caspase substrates (reviewed in [68, 69]). A relatively selective tetrapeptide caspase-3 inhibitor has been shown in independent studies to inhibit caspase enzyme activity, reduce brain tissue loss, and improve neurological outcome after experimental TBI [38, 40]. Similarly a pan-caspase tri-peptide inhibitor has been shown to improve functional outcome after TBI in adult rats [36, 108] and to reduce apoptotic neurodegeneration in the developing rat brain after TBI [36, 108]. A potential drawback of the tripeptide or tetrapeptide caspase inhibitors is that they might not penetrate the intact blood–brain barrier, unless delivered early after injury, when the blood–brain barrier is disrupted (typically hours after injury ). A unipeptide pan-caspase inhibitor Boc-aspartyl fluoromethylketone, which is capable of penetrating the blood–brain barrier, has been shown to reduce ischemic brain damage after systemic administration  but has not yet been reported in models of TBI. Important caveats aside from the potential for delayed tumor development exist in terms of treatment with caspase inhibitors. First, inhibition of caspase-dependent apoptosis might shift the mode of cell death to caspase-independent apoptosis or necrosis [111, 112]. Second, caspase activity might have an important homeostatic function in cytoskeletal remodeling and other physiologic processes . Third, caspase inhibitors might lead to the survival of dysfunctional cells, resulting in survival without functional benefit. Consistent with this was our report that treatment with DEVD reduced tissue damage without improvement in functional outcome after TBI in rats . PARP is an important enzyme for the repair of DNA damage and maintenance of genomic integrity; however, increased PARP activity can exacerbate the depletion of cellular energy stores under certain conditions promoting cell death . Although it is primarily felt to contribute to necrosis, a direct contribution of PARP activation to caspase-independent apoptosis mediated by AIF has recently been demonstrated [55, 63]. PARP inhibitors therefore represent one therapeutic strategy that might reduce caspase-independent apoptosis (and perhaps necrosis). Systemic administration of the PARP inhibitor 5-iodo-6-amino-1,2-benzopyrone at moderate dosing improved functional outcome after TBI in mice; however, higher doses that further inhibited PARP activity worsened performance in a memory paradigm . Other PARP inhibitors have also been shown to afford protection in experimental models of TBI [115, 116]. None of these studies have directly assessed the affect of PARP inhibitors on apoptosis. Another potential strategy would be to block both caspase-dependent and caspase-independent apoptosis by mitochondrial stabilization after TBI, either directly or through the regulation of the Bcl-2 family of proteins. Prevention of mitochondrial permeability transition with cyclosporine A or other immunophilins would attenuate the release of both cytochrome c and AIF . Cyclosporine A and FK506 have been shown to be protective in models of TBI, at least in part by reducing mitochondrial dysfunction and traumatic axonal injury [118–122]. Recently, the novel p53 inhibitor pifithrin α was shown to improve histological and functional outcome in rats after cerebral ischemia . Although apoptosis clearly contributes to secondary neuronal death after TBI both in experimental models and in humans, present studies have not been sufficient to confirm that apoptosis after brain injury is solely detrimental. Thus, there might be physiologic, as well as technical, limitations in approaches designed to reduce neuronal and glial apoptosis after TBI. The quiet elimination of cell debris and nonfunctional cells might be equally important for structural and functional recovery after TBI, being essentially 'molecular débridement'. That said, intuitively one would suspect that salvaging neurons after acute injury would optimize chances for maximal neurological recovery. Thus, it remains logical to continue the development of clinically relevant strategies targeting the selective reduction of apoptosis after TBI. = terminal deoxynucleotidyl transferase-mediated nick-end labeling. The authors appreciate generous support from the National Institutes of Health/National Institute of Neurologic Diseases and Stroke (RO1 NS38620 and P50 NS30318); the Department of Critical Care Medicine, University of Pittsburgh School of Medicine; and the Children's Hospital of Pittsburgh.